October 6, 2015 – Ninety-three million miles away from the Earth sits a fiery sphere of hot gas. It’s 332,946 times the mass of Earth and has surface temperatures reaching 9,932 degrees, which is capable of disrupting satellites, power grids and even pilots flying at high altitudes. The sun launches these attacks from its surface with a massive burst of gas and magnetic fields called a coronal mass ejection. The Airmen at the Holloman Solar Observatory are the hub of monitoring volatile solar activity and training others to do so as well. 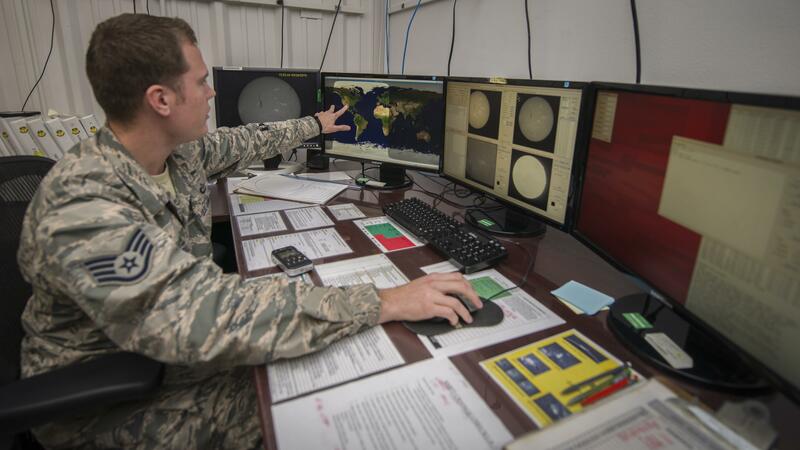 Although few in number, the Air Force solar observatories play a critical role in keeping the Air Force way of life running. A single solar storm could disrupt the Air Force way of life. The frequency of solar flares varies from several a day, when the sun is particularly active, to less than one a week during quiet periods. “The importance of watching the sun is that solar flares and any material that ejects off the sun can enter the atmosphere and affect Earth,” Sherard said. Each solar flare produces streams of highly energetic particles that can present radiation hazards to spacecraft and astronauts among many other possibilities. The Airmen have a wide range of impacts on both military and civilian organizations alike. Sending this information to both civilian and Defense Department entities allows for a more wide-spread analysis and real-world application of the provided information. Providing this information to both agencies allows for a more complete coverage in safeguarding measures and accurate research used for forecasting possible events. The benefits of the observatories extend from the earth-based infrastructure to space-based vehicles and their astronauts. If a solar event is powerful enough, it can create a surface charge, or even a drag on a satellite or space vehicle, which can affect its operation and orbit. Both electronically and physically, many facets can suffer negative consequences from increased solar activity. Keeping the solar telescopes in perfect working order requires constant calibration and preventative maintenance. High-powered equipment, such as the solar telescope, requires a high amount of accuracy and attention to detail to ensure the operators are getting reliable readings and delivering accurate information. Even the smallest of discrepancies in this equipment could have drastic and devastating effects on the people who count on the information gathered from the telescopes. All of this dedication and attention to detail is the reason why the Holloman Solar Observatory is the leader in both training and execution of their craft.